South Ridge Estates, an established residential community in Rutherfordton, NC, offers the rare combination of secluded living and convenience to the downtown area. Lot sizes at South Ridge Estates range from .5 acre to 3 acres. Whether looking for nearby schools, hospitals, shopping, etc, South Ridge Estates is centrally located for all. Rutherford Hospital and Main St are less than 5 minutes away and the brand new Rutherfordton Elementary (opening Fall 2009) is just around the corner from South Ridge Estates. If golf and tennis suit your fancy, Cleghorn Plantation Golf Club and Peach Tree Racquet Club are just minutes away. Homesite pricing ranges from $27,000 to $45,000, ideal for construction of a beautiful, new residence. 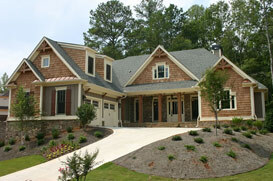 South Ridge Estates is a perfect community to build your new, custom home. Washburn Real Estate, Inc. is a leader in South Ridge Estates homes for sale, land for sale, vacation homes for sale, second homes for sale and New & Custom-built homes for sale in South Ridge Estates.